He had no formal education as painter and learned it all by himself, after a friend sent him a box of tubes with oil colors. He painted a lot of roses. 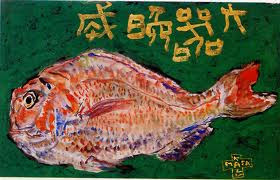 He also painted the fish of the market in Manazuru. CLICK for more of his artwork! 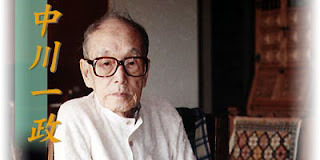 Later in his life he spent almost 20 years in the harbor of Manazuru, painting the landscape in many colors and a lot of "deforme". The blue sky was the ceiling of his open atelier, as he called it. Only on rainy days would he stay inside and paint rosed in his room. He compared himself to Daruma san, who spent 9 years in front of a wall meditating ... just that it took him longer. bring the subject "to life". Beauty was not his concern, but "to be alive". There is a museum in his honor in Manazuru. 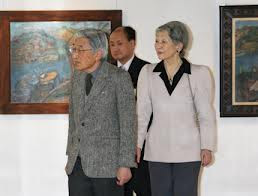 Even the emperor and his wife have been here to look at his paintings.